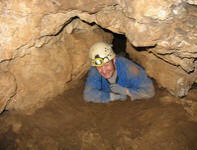 The DCC was formed in about 1960 from the Northern Section of the Orpheus Caving Club. Since that time, it has grown to a membership of about 100 at its peak although membership has dropped back to about 60 in recent years. The members' interests range from pure caving for a sport through digging and surveying to mine excavation and exploration. To reflect the range of interests, this site has been built in separate parts covering the caving and the Alderley interests. However as in the Club, there are strong links and common ground between these two areas. There are links on most pages to other sites of related interest. We hope you enjoy your visit. Please feel free to comment on the site or send me any information that may add to the value of the site or knowledge about the DCC. You can send an e-mail here to the Webmaster. All information is © Copyright Nigel Dibben 2000-2019 except where otherwise noted.